Healthy and glowing skin, hairs and nails are indication of blooming health and wellness. 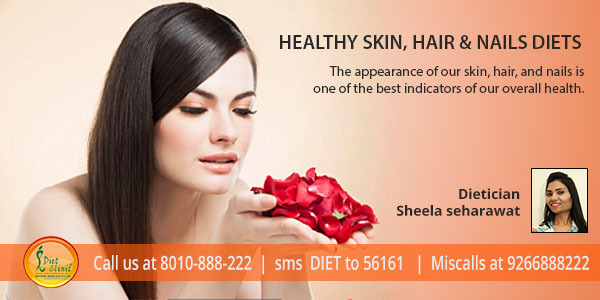 Diet Clinic is offering healthy diets which carry essential nutrients for wellness of hairs, nails and skin. Multivitamin rich fruits and fiber rich salad will help you glow and feel charming. Hydrated body with plenty of water intake makes this plan far more successful. Take a 30 minute healthy walk daily for getting ideal weight and look younger then now. Call Diet Clinic for seeking assistance from our expert dieticians. Protein plays a very important role in the healthy look of your skin, hair and nails. Our body requires many other things too so the need and importance of balanced diet can’t be over looked. A balanced is the combination of your whole diet plan which is rich in antioxidants, essential vitamins and minerals such as zinc biotin, omega-3 fatty acids and vitamins A, B, C, D and E that enhance the overall health and appearance of your skin, hair, and nails. It is also very important to maintain the hydration as a well-hydrated skin is somewhat less prone to developing wrinkles. Indeed, Proteins like Keratin, collagen and elastin play an important role as they strengthen and provide elasticityto skin and stop wrinkles too. Iron also plays an important role in providing vitality and lustre. It also gives energy to the body. If you are lacking iron that means your hair, nails and skin will suffer badly. Your skin may look pale. It may itch. Nails can become brittle and develop vertical stripes or even become spoon shaped. Eating healthy is good for you. It keeps you disease free, improve your immune system, increase your energy levels and even affects your sleeping habits. But there are some foods that can improve the way you look, too. Hair, skin and nails reflect many biochemical imbalances in the body. It is therefore very important to maintain a healthy balance of nutrients to ensure well-nourished, beautiful hair, skin and nails. To have glowing skin, strong nails and shining hair you must feed your body with the right foods. They are whole, raw, nourishing ones. Cooked whole foods can do wonders for your body but often raw foods deliver more nutrients and hydration and obviously – less processing is required. We at diet clinic understand you the best and will give you the best diet plan, which offers you the best nutrient-rich diet, well-balanced diet, which is necessary for a healthy body. The diets we will give you to eat will play a primary role in how healthy you look and feel. This is a 30day long program, wherein the diet plans are meticulously planned as per the client need so every plan is unique and fresh. At one time, we give 3-4 days diet plan and you can expect to lose 1/2 to 1 kilo per week based upon your metabolism. Every week, we plan the diet after consulting you and considering your feedback. Overall, you can expect to lose 3-5 kg and few inches in 30days time.